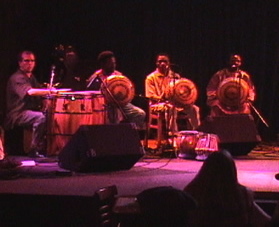 Doug Brush Percussion - With the djmebe master, Mamady Keita, and my good friend Taylor. With the djmebe master, Mamady Keita, and my good friend Taylor. Playing with three amazing mbira players from Harare, Zimbabwe at Martyrs in Chicago. With Dave Stringer and Allana Kaivalya in New Zealand. Playing with Akabley at the Vanity Club in Accra, Ghana. Recording a High Life album on a back porch in Kokrobite, Ghana.